Battling a long-drawn legal tussle with Sebi, conglomerate Saharas claim to have as many as 4,799 establishments under its fold, but its 'Chief Guardian and Managing Worker' Subrata Roy holds board seats on just a handful of registered group companies. An analysis of regulatory filings made by different group entities with the Ministry of Corporate Affairs also shows that there are very few registered companies where Subrata Roy's wife (Swapna Roy), brother (Joy Broto Roy) and two sons (Seemanto and Sushanto Roy) serve as directors. The two Sahara companies -- Sahara India Real Estate Corp Ltd (SIRECL) and Sahara Housing Investment Corp Ltd (SHICL), which were charged by Sebi for raising over Rs 25,000 crore (Rs 250 billion) through "various illegalities" and were asked to refund that money, do not have Subrata Roy as well as his family members as directors. Image: Subroto Roy (R), chairman, Sahara India, with his wife Swapna Roy. Incidentally, Seemanto Roy put in his papers as a director of SIRECL effective from March 10, 2008 -- just days before the company filed its papers with Registrar of Companies (RoC), Kanpur, for raising money through Optionally Fully Convertible Debentures (OFCDs), shows MCA filings. Sushanto Roy too had resigned from SIRECL board on February 29, 2008. After raising funds, SIRECL had also decided to change the company's name to 'Sahara Commodity Services Corporation Ltd'. Subrata Roy himself is on boards of at least 15 companies, including Sahara Prime City whose IPO filing had led to Sebi launching a probe into the group's affairs. Besides, he holds directorships in companies like Sahara One Media and Entertainment (one of the two listed group firms), Sahara India Life Insurance, Sahara India Financial Corp, Sahara Hospitality and Sahara Welfare Foundation. 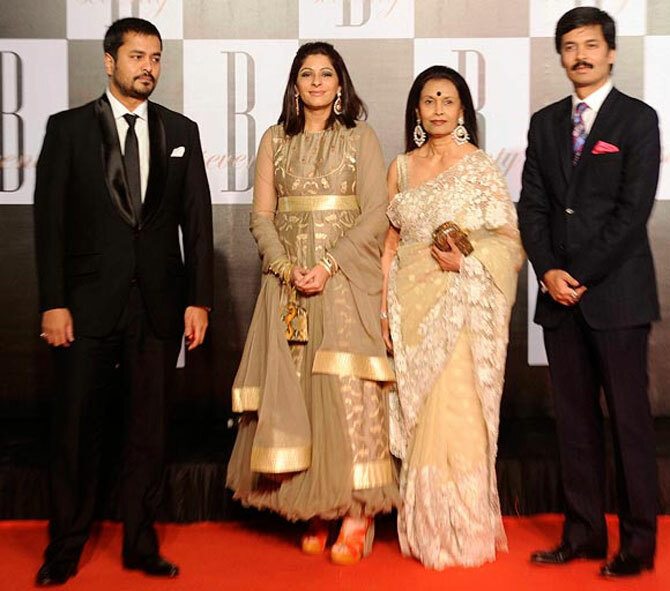 Image: Sahara founder Subrata Roy's wife Swapna, sons Seemanto (L) (with his wife Chandni Roy) and Sushanto (R). The other listed group entity, Sahara Housingfina has got Seemanto Roy and Joy Broto Roy as directors, among others. Subrata Roy, as also Ashok Roy Choudhary and Ravishankar Dubey (directors of SIRECL and SHICL), are currently in jail in connection with the refund case. The Supreme Court has exempted another director of these two firms -- Vandana Bhargava -- from being jailed. An analysis of regulatory filings of various Sahara companies shows that these three persons serve as directors on many other firms as well. Choudhary is on board of at least 22 companies, while Dubey and Bhargava are directors on at least 18 and 15 group entities, respectively. Another close confidante of the Sahara chief, O P Srivastava, is a director on at least ten group firms, including the two listed firms. 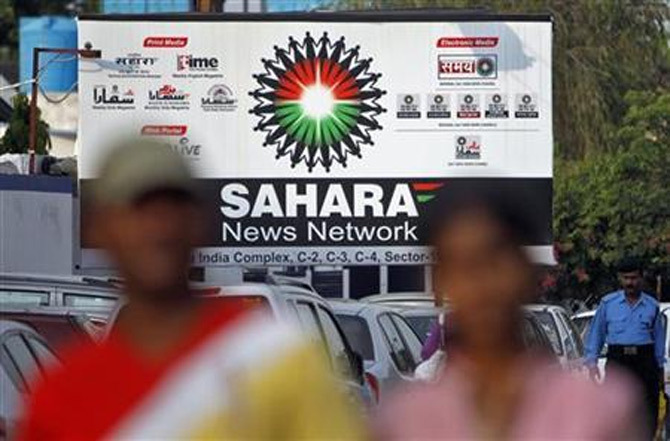 Sahara group claims to have 4,799 establishments and net worth of more than Rs 68,000 crore (Rs 680 billion), while it pegs its total asset value at over Rs 1.5 lakh crore. 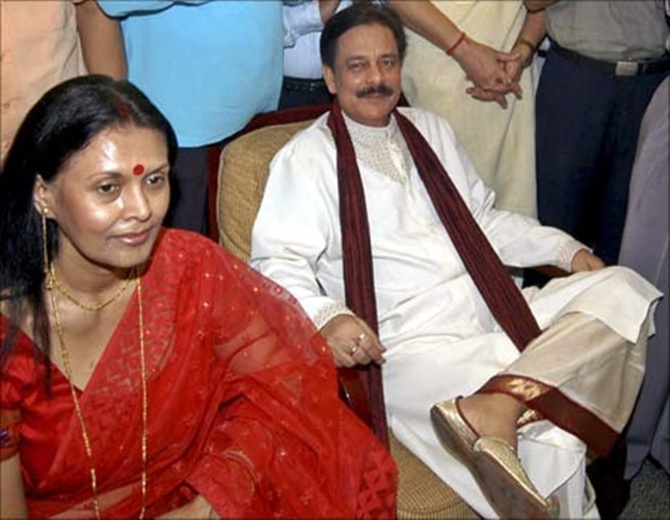 Roy's two sons -- Seemanto Roy and Sushanto Roy – as well as his wife Swapna Roy are also on the boards of various Sahara companies including Aamby Valley Ltd. Seemanto is part of at least seven entities while sibling Sushanto has directorships in at least 13 firms. Swapna is a director in about 15 Sahara group companies. The Sahara chief's brother J B Roy is a director in at least six entities. Image: Sahara group chief Subroto Roy organised a bash for Sridevi to celebrate her Padma Shri award. Even as the legal tussle with Sebi has landed Roy behind the bars, the group remains ambitious with plans to venture into newer business areas. The group, which describes itself as 'Sahara India Pariwar' recently unveiled large scale plans for its businesses that would see hiring of more than 56,000 people across segments. "Now Sahara India Pariwar is venturing into new businesses and we need more than 56,000 kartvyayogis. The recruitment will take place in phased manner. "Currently we are having openings in various sectors such as Dairy, Poultry, Fishery & Allied Agriculture, Food Factory, Healthcare, Construction, Leisure & Hospitality, Education and Retail," according to its website. Image: Legal tussle with Sebi has landed Roy behind the bars.